If missing teeth have you missing out on the fun things in life – your favorite foods or even smiling for family photos – the team at Green Tree Dental wants to help you start enjoying life again! 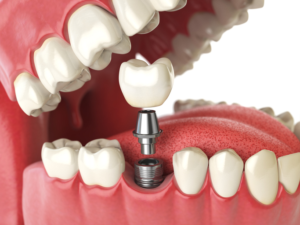 We provide dental implants, a permanent way to replace one or many missing teeth. Permanent dental implants look, feel, and function just like your natural teeth, so you can have the confidence to do all the everyday things that you’ve stopped doing because of missing teeth or unsecure dentures. Dental implants consist of two parts: a small titanium post that we surgically place into your jawbone in place of the root of your missing tooth (this is the actual implant), and the restoration that sits on top. The titanium post fuses with your bone to provide a solid anchor for the restoration, which we design to look just like your natural teeth. The restoration can be a dental crown, a bridge, or an implant-supported denture. At your implant consultation, we’ll discuss which restoration is best for your needs, budget, and lifestyle. A crown or bridge is typically best for replacing a single tooth or a couple of teeth in a row, while a denture is best if you’re missing most or all teeth in a single arch. You shouldn’t avoid getting a fully functioning smile because you’re afraid you can’t find affordable dental implants! At Green Tree Dental, we have flexible financial options, and we’ll do everything we can to work with your budget. We know that your oral health is important, and so is having a smile that looks and feels great. Call our office today to speak with our friendly and knowledgeable team about your needs and budget!